Tonight I preached with Dr. Darrell Cox pastor of the TRINITY BAPTIST CHURCH of Mocksville, NC. This was the opening night of the ANNUAL SOUL WINNING CONFERENCE for Dr. Ray Rameriz who pastors the HILLSIDE BAPTIST CHURCH of Los Angeles, CA. The building was jammed packed. Chairs were added and the balcony was packed as well. This dear church baptized 2,500 converts last year and is one of the leading soul winning independent Baptist churches in America. Dr. Cox preached on “NO REGRETS.” What a great truth! He certainly out did himself tonight with his preaching. Dr. Cox and I enjoy being with each other. I preached my sermon “THERE IS YET ONE.” I used I Kings 22:1-8 and the story concerning Ahab and Jehoshaphat. The text verse was verse 8! 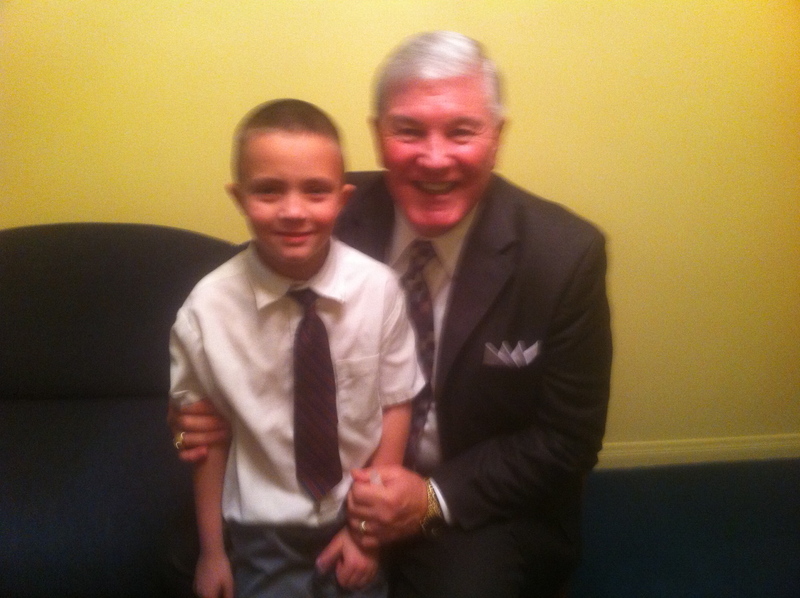 Micaiah was the main Bible character and after the service a little 8 year old boy shook my hand and said, “Hello my name is Micaiah!” Amazing! There were 400 prophets who all agreed on this unholy alliance yet when asked if there was any other prophet they could hear from, Jehoshaphat reluctantly said, yes there is. “There is yet one man, Micaiah the son of Imlah, by whom we may inquire of the LORD: but I hate him; for he doth not prophesy good concerning me…” Thank God there was yet one man who stood alone against the majority of the clergy! He was put on a diet of bread and water, but better a prophet on bread and water than a politician at the feasts of Ahab. This was a day of unification, with Ahab and Jehosaphat uniting. It was a day of unanimity with 400 prophets in unison. It was a day of uniformity. The messenger advised Micaiah that the clergy had agreed and that he should go along with them! We live in the same kind of a day of unification. It is a time of unanimity! This is a time of “yes men” and “rubber stamps.” We are like eggs in a crate. We are gradually being homogenized into one faceless monolithic mass! It is the day of the lowest common denominator. A day of the happy medium and the middle of the road. This is a Rodney King theology at work! A pleasant “get-alongism” and a “togetherness” has so paralyzed us into spiritual inertia that it is almost impossible to arouse us from an amiable stupor! The steamroller is flattening all the mountains into one level plain. These times and such times as these do not breed prophets but puppets! Men who truly speak for God never merge into the fog around them. Noah stood alone! Elijah stood alone! Amos stood alone! When a man of God speaks a pleasing message hoping for a return engagement he has forfeited his right to represent God! Jeremiah stood alone! Daniel stood alone! Paul stood alone! True prophets are solitary people. Eagles do not fly in flocks! It is not easy being a lone dissenter. When the messenger was sent to Micaiah he must have said in effect, “The clergy have agreed and you had better make it unanimous. This is a good gravy train and you had better ride it.” The same subtle pressure exists in 2011 for preachers to get in step with the times and ride the wave of the future. What fundamentalism needs in 2011 is more preachers out of step with the current wind, current times and become like Micaiah. We are told to adjust! Adjust to what? A Bible that is not inspired? A Saviour’s blood that dissipated at the foot of Calvary? God’s man need only adjust to the inspired Word of God and God’s will. It is not the business of a prophet to harmonize with the times and the majority. The prophet is a soloist! He was never meant to play the accompaniment to anything and anyone. The pulpit is not a platform to boost the projects of man. When the prophet at Bethel backslid in his own revival. He who could turn down a king was deceived by another prophet! JUST A THOUGHT!